If you are looking for a space-saving solution to display the products in your store, turn to Pure Display. We have a number of gift shop displays to suit your exact needs. Our display units are reasonably priced and are of top-notch quality. Make use of our excellent collection to flamboyantly display your products. Our window displays are the ideal options for attracting the attention of the prospective passing customers. 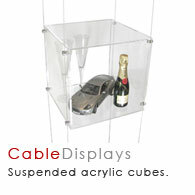 Acrylic cube sets at our disposal are both sophisticated and graceful. If you wish to display valuable products, you can opt for a lockable version of the same. Our lockable gift shop displays are perfect for retailers wishing to showcase their high valued items. Our glass units keep your product safe, while allowing your potential customers to get a full view of the product. If you have a lot of products to display, our glass connector cube system is the ideal solution for you. The glass panels are sturdy structures that can be easily assembled and dismantled. 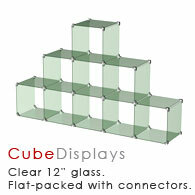 The Glass Cube Display Set 4X3 or Glass Cube Display Set 5X3 Double Stepped are available in flexible configurations. These portable units can be packed up and stored, without any hassle. 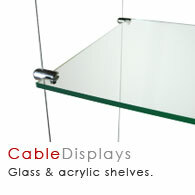 Pure Display is one of the leading online suppliers of display systems. We offer our A1 quality products at competitive prices, along with quick delivery till your doorstep. Our entire team strives hard to provide next day delivery to our customers, wherever possible. If you want stylish and enticing gift shop displays, we are your one-stop platform. Find everything you need at your fingertips.